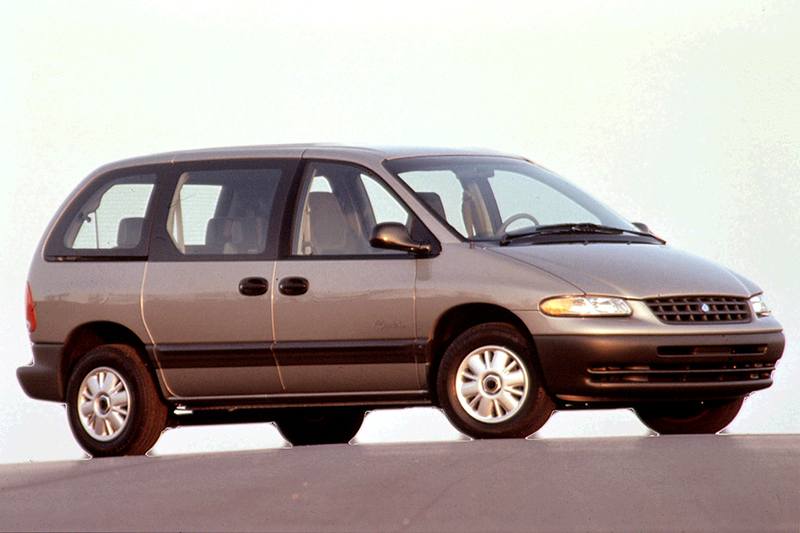 Basically, you can hardly beat a Voyager or its Dodge near-twin in the minivan league. Most families are likely to appreciate that extra sliding door, so it’s worth looking for a Voyager that has that option. More aerodynamic in shape than their predecessors, the new Chrysler minivans could be equipped with a sliding door on the driver’s side, and center and rear seats had built-in “Easy Out” rollers. All models had a sliding door on the passenger side, plus a one-piece rear liftgate. The Dodge Caravan and Chrysler Town & Country are nearly identical.Minivans came in standard Voyager and long wheelbase Grand Voyager body styles, each holding up to seven occupants. Plymouths came only in base and SE trim. Dual airbags and antilock braking were standard at first, but ABS became an option on base minivans during the 1996 model year. All models were front-drive. Base engine was a new 2.4-liter 4-cylinder with dual camshafts. Two V6s were available: 3.0- and 3.3-liter, making 150 and 158 horsepower, respectively. Changes were few for 1997. Rear bench seats added grocery bag hooks and an Expresso Decor package was added. 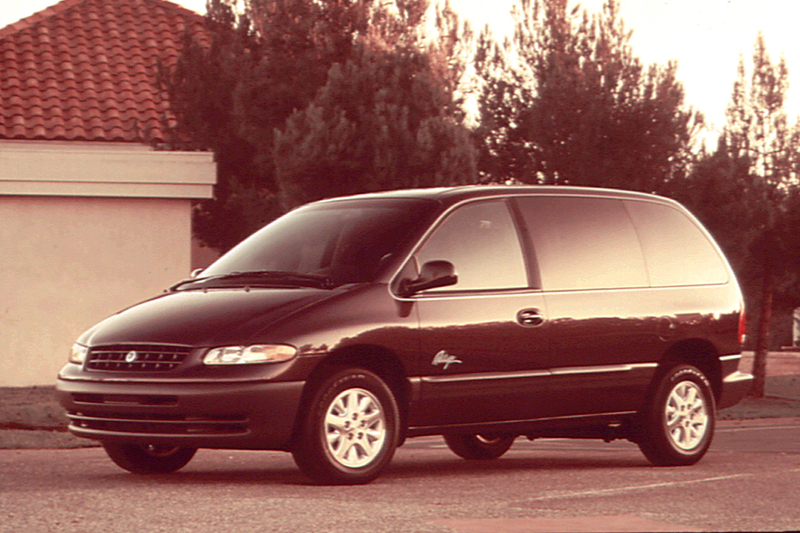 Plymouth added a 3.8-liter V6, already available on Caravan and Town & Country, to the Voyager for ’99. Other changes included a small cargo net between the front seats, additional standard equipment, a child-safety seats in second-row buckets. Air conditioning and 7-passenger seating became standard instead of optional. A rear-seat video entertainment system was newly available, dealer-installed on all models. During 2000, Voyagers adopted a Chrysler badge instead of Plymouth. Voyagers initially came with any of three engines: a 2.4-liter 4-cylinder, or two V6 sizes. A 3-speed automatic transmission had been standard with the 4-cylinder engine and the smallest (3.0-liter) V6. Models with the 3.3-liter engine, and all SE Voyagers, got a 4-speed automatic transmission with an overdrive gear ratio. 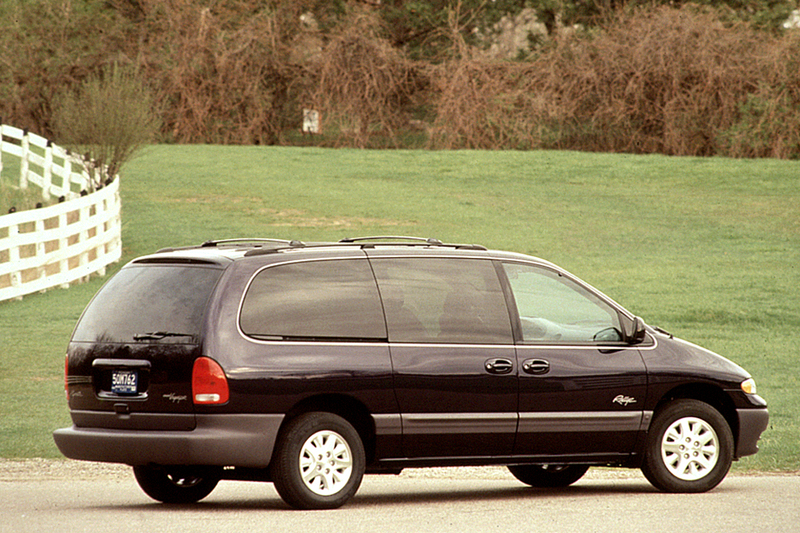 In ’99 Plymouth added the corporate 3.8-liter V6 to the lineup. It brought 180 horsepower to the game and came only with a 4-speed automatic. 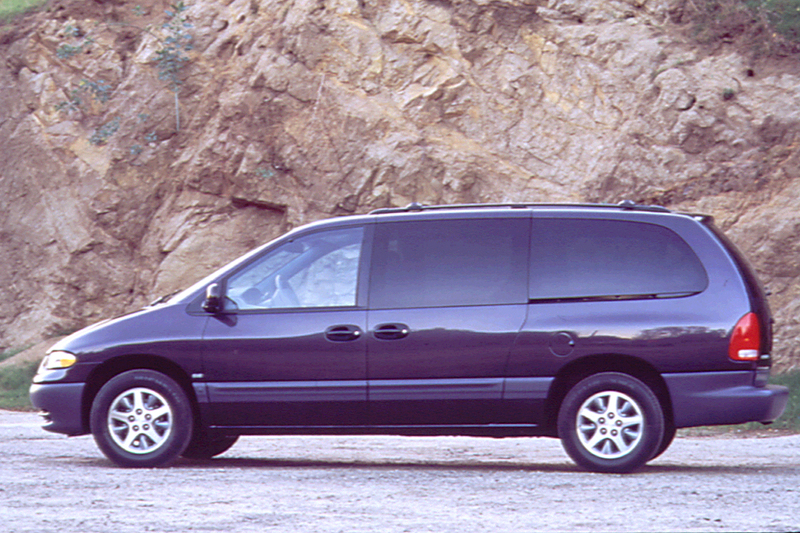 Quieter and even more carlike than before, these minivans handle more like large sedans than vans. Steering is light and precise, and the suspension provides stable cornering with only modest body lean. The suspension easily irons out most smaller rough spots, and the ride is comfortable overall. Performance with the 3.3-liter engine is quite strong, even in the longer Grand Voyager–provided that it’s not loaded down with people and cargo. Even then, passing power is sufficient, making that engine a wise all-around choice for those who carry heavy loads or a full complement of passengers. The 4-cylinder engine is too weak for a vehicle of this weight, though acceleration is adequate with the smallest (3.0-liter) V6. Fuel economy is about average for a minivan. Well-designed and roomy inside, Voyager got a new dashboard with larger gauges and revised controls–closer to the driver than before. Occupants ride on supportive chair-height seats, while bigger windows and a lower dashboard improved visibility. Front seat travel also has increased, as has middle-row head room. A wider body also gives extra shoulder and hip space. Entry/exit also is easier, thanks to door sills that are 1.4 inches lower. Description: Rear-seat bolts can fracture; in accident, seat could break away. Description: Fuel can leak from tank at interface of fuel pump module attachment. Description: Tank rollover valve can allow fuel to enter vapor canister, resulting in potential leakage and fire. Description: Static charge could cause spark as tank is being filled; vapors could ignite. Description: On a few minivans, bolts holding integrated child seats can break. Description: Shoulder harness restraint on child seat can be difficult to release when latch plate becomes contaminated. Description: The clockspring may have been wound incorrectly, resulting in illumination of airbag warning light and possibly causing the driver’s side airbag to not function. Dealer will insect and replace affected parts on vehicles with 70,000 miles or less. Description: Certain master cylinder seals will not seal adequately, allowing fluid to be drawn into power-assist reservoir. Description: A few wheels were damaged during mounting. Description: Tires were damaged and may lose pressure suddenly. Description: The D-pillar mastic sound barrier patch could loosen and drop into the seatbelt assembly, rendering it inoperative. Description: Shoulder harness webbing was incorrectly routed around reinforcement bar; can fail to restrain child properly. Description: Driver’s airbag on some minivans may become disabled due to a failed clockspring in the steering-wheel hub; airbag warning lamp should illuminate. Description: O-ring seals can degrade over time, allowing fuel leakage. Description: Some trim material can slip into the rear outboard-seatbelt assembly and render the seatbelt inoperative. Front air conditioning, CYE 7-passenger Seating Group (folding 2-passenger middle bench seat, folding 3-passenger rear bench seat), rear sound insulation, storage drawer below passenger seat, cargo net. Cruise control, tilt steering wheel, power mirrors and windows, power door locks, upgraded door panel trim. Base regular length requires V6 engine, Pkg. 25T/26T/28T. Premium cloth upholstery, CYS Deluxe 7-passenger Seating Group (reclining/folding middle bucket seats, and rear 3-passenger bench seat with adjustable headrests), 8-way power driver seat, overhead console, trip computer. Sunscreen glass, windshield wiper de-icer. Sunscreen glass, rear heater and air conditioning w/dual controls, overhead console, trip computer. Heavy-duty suspension, full-size spare tire. Loading Group plus heavy-duty battery, alternator, brakes, radiator, and transmission-oil cooler, trailer wiring harness. Requires 4-speed automatic transmission and option pkg. Base regular length requires 4-speed automatic transmission and option pkg. Cruise control, tilt steering column, power mirrors. Requires option pkg. Group I plus power locks. Requires option pkg. Cruise control, tilt steering wheel, power mirrors and windows, power door locks. Requires option pkg. Remote keyless entry, illuminated entry, headlight-off delay. Requires option pkg. Group III plus theft-deterrent system. Folding 2-passenger middle bench seat, folding 3-passenger rear bench seat. Reclining/folding 2-passenger middle bench seat with two integrated child seats and adjustable headrests, folding 3-passenger rear bench seat. Requires option pkg. Deluxe 7-passenger Seating Group with two integrated child seats in middle bench. NA with Pkg. 25L/28L/29L. Reclining/folding middle bucket seats and rear 3-passenger bench seat with adjustable headrests. CYS Quad Seating Group with integrated child seat. Includes 10-speaker Infinity sound system.